Happy birthday, Sheero! Happy birthday, Sheero! Happy birthday, happy birthday…. HAPPY BIRTHDAY, SHEERO!!!! It’s my dog’s birthday today! 🙂 I don’t know yet what I’ll give her, probably some munchies. Dogs are easier to please, you know. Unlike people, they don’t care what you give them, as long as you give them something to munch on. Heck, they don’t even care if it’s their birthday! 😀 Anyway, even if Sheero doesn’t know she just turned three today, we’ll give her something. 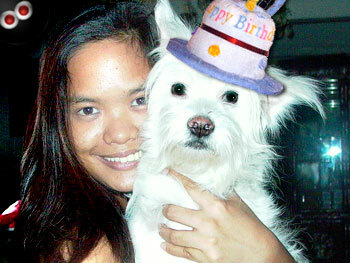 This entry was posted on Tuesday, 25 April 2006 at 7:09 am and is filed under Birthdays, My Pets. nice blog 😉 happy bday to sheero!